This is part three of a three part series on the new NBA TV studio. Part one can be viewed here and part two can be viewed here. 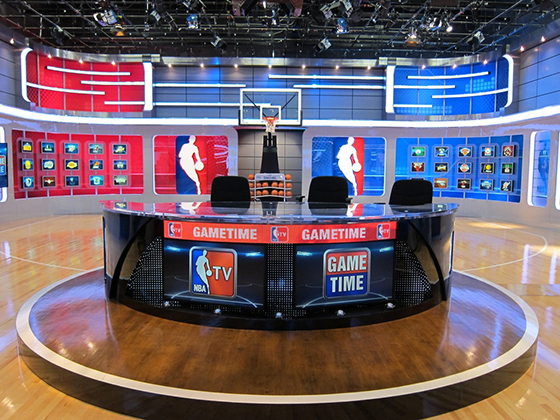 Creating a new home for NBA TV was a large undertaking by Innovative Show Design (ISD), bringing together design, technology and skilled people. 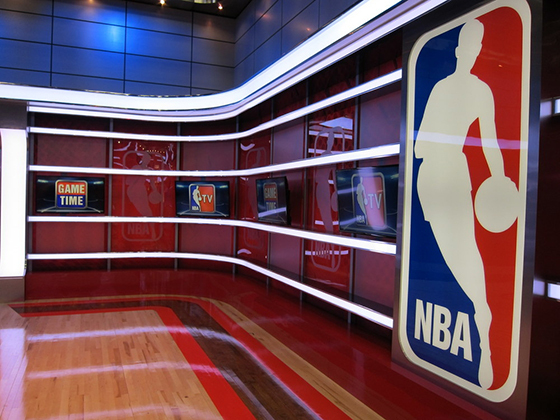 NBA TV wanted a technologically advanced studio, and ISD was able to deliver. NBA TV wanted to stand out from the crowded sports TV market and encapsulate the game into its set. Its number one request? A real basketball court on set. “We wanted this entire studio to look and feel like basketball, and we felt that this could not of been achieved unless a minimum of a half court was incorporated into the design,” said Justin Garrone, artistic director at ISD. The final design includes a true to scale half court, complete with a three point line and basketball goal. This was able to happen because of ISD’s research into the client. To make the basketball court as realistic as possible, ISD worked with the same companies that supply the NBA. Horner Flooring provided the hardwood, which took 10 day to lay, sand, paint and finish. Then, the floor cured for roughly three weeks. Spalding provided and installed the basketball goal on set. “I was amazed to watch the precision that went into this process. It came down to 1/16″ of an inch, to make sure the goal sat in the correct spot on the court,” said Garrone. Every detail of the court was important, right down to the flooring. ISD worked from the court out, using it as the first element of design. LED lighting was used throughout the set, saving energy, and providing a bright look on-air. The internally lit scenic elements used 96 five meter rolls of RGB LED tape. LED lighting also allows NBA TV a chance to change the sets look on cue. The desk was also enhanced with a Martin Lighting 25 mil LED tile. Through this, the desk can have constant moving backgrounds and branding. 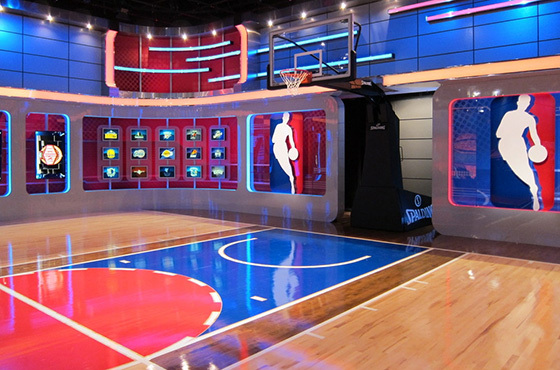 The NBA TV project was a 5,000 square foot undertaking by Innovative Show Design that combined skilled craftsman, design and lighting to create a new home for a rising sports network.